Sixteen-year-old Robin loves music more than anything. Even her list of criteria for the perfect guy specifies that he must have great taste in music, in addition to the usual points like tall, dark, handsome, etc. So when Carter walks into the restaurant where she works, things get a little complicated. In addition to being tall, dark, and handsome, Carter is deaf. He is also tired of feeling like an outsider among hearing people in this small town in upstate New York that he's visiting for the summer, so he's eager to get back to his life in the big city where he can sign as fast as he wants to and he doesn't get left out of in-jokes. But the attraction is instant, and the chemistry is undeniable, and before long, the two are facing the age-old question: "A fish may love a bird, but where would they live?" Meanwhile, the end of the summer looms large. The story is told in alternating narrative POVs. Okay, so... I LOVED this book. LOVED IT. It's past 4am right now as I'm typing this - that's how much I loved it. There's a lot of insight to glean from this book, but I first want to point out (quite shallowly?) that this book is cute as buttons. Robin and Carter are cute as buttons! As the vernacular goes, I ship them so hard. I couldn't help but root for them the entire way, to the point that Trent and Jolene (their respective exes) were absolutely detestable to me, even though I'm sure they weren't supposed to be hated so vehemently. I wanted to reach into my Kindle and slap them both, like, "STEP OFF!" When they are together, or with each other's families and close friends, everything is okay. But when the outside world creeps in, then things get difficult. Carter constantly has to deal with things like people yelling to him after he tells them he's deaf, people doubting his ability to drive safely, people giving him looks of pity... Robin also gets expressions of pity, which she finds hurtful (whereas Carter has just gotten used to it all), or people who assume that she's "taking out the deaf guy" just to be kind. They manage to deal with it, but there is one bridge that can't be crossed, and it's that music has always been Robin's first love. She plays for her church band, and she loves it, but it is difficult for Carter, who is also non-religious, to see himself fitting into this most important part of her life. At the climax of the story, as the two are having a huge fight, Robin says that she envisions that in Heaven, everything is perfect, and they can both hear music and sing together, and Carter points out to her that what she's saying is that in her perfect world, there's no room for deaf people, and this was such an important point, because our society has so ingrained us to think of people with disabilities as lesser, like they are broken somehow and need to be fixed. But of course they are not, and in the book, this is something clearly demonstrated through all of chapters written from Carter's point of view. 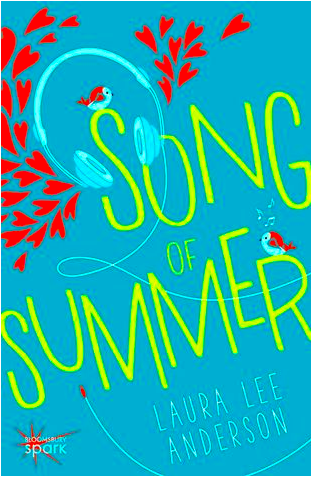 Carter is a regular teenage boy, in love with this teenage girl, and he does not need to be changed or healed - he just wants to be loved for who he is. And it's a point that Robin seems to have trouble realizing, until too late. This book was adorable, lovely, insightful, and emotionally-packed, and it's a quick read that is perfect for summer. I found myself feeling very upset when it was over, because I wanted more. I was utterly charmed! And bonus points for quoting The Princess Bride.